President Trump has praised a ruling by a federal judge that says the Affordable Care Act known as Obamacare is unconstitutional. The White House has hailed the ruling Obamacare is unconstitutional, but says the law will remain in place pending its expected appeal to the Supreme Court. 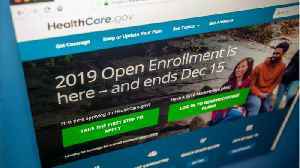 ▶ Videos for "Obamacare Unconstitutional"
U.S. President Donald Trump’s administration has stepped up its attack on the Obamacare health care law. The administration telling a federal appeals court it agrees with a Texas judge’s ruling..